Premier Suite » The Gordon Hendricks Elvis Show! The Gordon Hendricks Elvis Show! 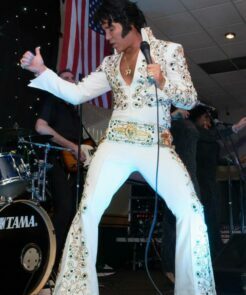 The World’s Greatest Elvis Tribute Show is Back by Popular Demand at The Premier Suite Cannock on Saturday 18th May! Prosecco Drinks Reception, Gourmet Meal, The Gordon Hendricks Elvis Show with his fabulous Live Band, followed by a Live Party DJ & Late Night Bar!